"Raytheon is an expert in RF technology," said Lee Silvestre, director of Mission Innovation at Raytheon IDS. "What makes this effort a breakthrough is that similar RF technology that we have been applying in core defense products -- radars for tracking and guidance systems -- has demonstrated applications in the energy crisis." 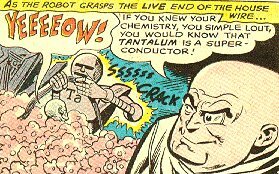 Whatever Raytheon's scheme is, it was probably foreshadowed in The Comic Book Periodic Table of the Elements. 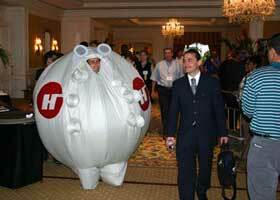 Fred Wolf and a colleague at Halliburton demonstrated yesterday at the Catastrophic Loss conference in Florida three SurvivaBall mockups, and described how the inflatable units will sustainably protect managers from natural or cultural disturbances of any intensity or duration. The devices will include sophisticated communications systems, nutrient gathering capacities, onboard medical facilities, and a defense infrastructure to ensure that the corporate mission will not go unfulfilled even when most human life is rendered impossible by catastrophes or the consequent epidemics and armed conflicts. The new developments are merely the latest problems in a program that was supposed to showcase the Bush administration's commitment to developing a broad national defense against bioterror attacks...but lately members from both parties have criticized the government's handling of it and demanded more progress. The anthrax program is by far the biggest contract awarded under BioShield to date. With large inflated breasts, she felt like she had a protective zone. UPDATE: Just in case I've confused anyone, please note that at least one thing described in this post is a joke. Are joo sure that the survivaball theengy ees no just a prank from The Yes Men? Cuz' I theenk eet ees, joo know? I know it is...I was just being silly. The gag is explained if you click the link to WMMNA. The inflatable breasts dress is kinda like Chimpy's flight suit, only much more convenient, since he had to stuff a sock in it. The ability to adjust your codpiece on the fly would be a huge benefit. It would probably be marketed mostly for guys who go to pickup bars, but the preznit could pump it up in response to falling approval ratings. I think you've hit on a million-dollar idea. Let's get busy! Got any contacts in the Marianas?